^ "Pueblo Incident". "Naenara" News from South Korea. Archived from the original on 27 May 2015. ^ Schindler, John R. "A Dangerous Business: The U.S. Navy and National Reconnaissance During the Cold War" (PDF). p. 9. Retrieved 24 June 2013. ^ "USS Pueblo – AGER-2". Naval Vessel Register. Retrieved 11 June 2009. ^ a b MacClintock, R. "USS Pueblo Today". USS Pueblo Veteran's Association. ^ "List of active ships". Naval Vessel Register. NAVSEA Shipbuilding Support Office. Archived from the original on 4 February 2012. Retrieved 23 May 2013. ^ "U.S. Army cargo ship FP-344 (1944–1966), later renamed FS-344". Naval History and Heritage Command Online Library of Selected Images. 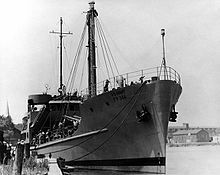 ^ "World War II Coast Guard Manned U.S. Army Freight and Supply Ship Histories: FS-344". U.S. Coast Guard. ^ a b c d e f g h i j Newton, Robert E. (1992). "The Capture of the USS Pueblo and Its Effect on SIGINT Operations" (PDF). U.S. Cryptologic History, Special Series, Crisis Collection, Vol. 7, National Security Agency (NSA). Retrieved 19 February 2010. ^ "Attacked by North Koreans". USS Pueblo Veteran's Association. Archived from the original on 28 August 2008. Retrieved 11 June 2009. 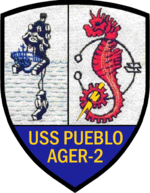 ^ "USS Pueblo AGER 2: Background Information" (PDF). National Security Agency. p. 10. Archived from the original (PDF) on 18 September 2013. Retrieved 13 June 2013. ^ "USS Pueblo". Dictionary of American Naval Fighting Ships. ^ "Questions of international law raised by the seizure of the U.S.S. Pueblo", Proceedings of the American Society of International Law: at its sixty third annual meeting held at Washington, D.C., 24–26 April 1969. American Society of International Law. ^ "North Korean Transmissions from January 1968: Chronology" (PDF). National Security Agency (NSA). 1968. Archived from the original (PDF) on 18 September 2013. Retrieved 26 June 2013. ^ Mobley, Richard A. (2003). Flash Point North Korea. Naval Institute Press. ISBN 978-1-55750-403-6. 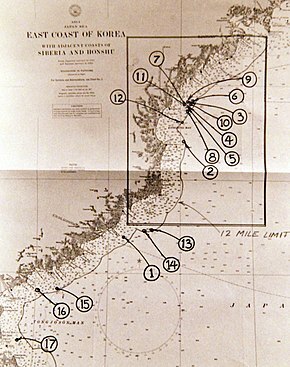 ^ "N. Korea Seize U.S. Ship, 1968 Year in Review". UPI.com. 1968. Retrieved 11 June 2009. ^ "Interview with Horace W. Busby, 1981". WGBH Media Library & Archives. 24 April 1981. Retrieved 9 November 2010. ^ John Prados and Jack Cheevers, ed. (23 January 2014). "USS Pueblo: LBJ Considered Nuclear Weapons, Naval Blockade, Ground Attacks in Response to 1968 North Korean Seizure of Navy Vessel, Documents Show". National Security Archive. Retrieved 10 August 2018. ^ a b c Lerner, Mitchell; Shin, Jong-Dae (20 April 2012). "New Romanian Evidence on the Blue House Raid and the USS Pueblo Incident. NKIDP e-Dossier No. 5". Woodrow Wilson International Center for Scholars. Retrieved 23 April 2012. ^ Iredale, Harry; McClintock, Ralph. "Compound 2 'The Farm'". USS Pueblo Veteran's Association. Archived from the original on 30 September 2010. Retrieved 30 September 2010. The treatment would become better or worse depending upon the day, the week, the guard, the duty officer or the situation. ^ Stu, Russell. "The Digit Affair". USS Pueblo Veteran's Association. Archived from the original on 30 September 2010. Retrieved 30 September 2010. The finger became an integral part of our anti-propaganda campaign. Any time a camera appeared, so did the fingers. ^ "Bush lauded for handling of EP-3 incident". WorldNetDaily. Archived from the original on 1 February 2009. ^ "End of North Korea?". The Palm Beach Times. ^ Cheevers, Jack (2013). Act of War: Lyndon Johnson, North Korea, and the Capture of the Spy Ship Pueblo. Penguin. ISBN 978-0-45146-619-8. ^ a b c Kennedy, Charles S. (27 March 1995). 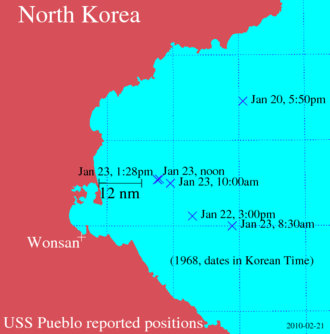 "The USS Pueblo Incident – Assassins in Seoul, A Spy Ship Captured". The Association for Diplomatic Studies and Training: Foreign Affairs Oral History Project. Retrieved 20 February 2013. ^ Probst, Reed R. (16 May 1977). "Negotiating With the North Koreans: The U.S. Experience at Panmunjom" (PDF). Carlisle Barracks, Pennsylvania: U.S. Army War College. Archived from the original (PDF) on 25 July 2008. Retrieved 17 December 2009. ^ FC Schumacher and GC Wilson (1971) Bridge of No Return: The Ordeal of the USS Pueblo, Harcourt Brace Jovanovich, New York. ^ a b "Remembering the Pueblo and North Korea". The San Diego Union-Tribune. 19 December 2011. Retrieved 18 October 2014. ^ Bucher, Lloyd M.; Mark Rascovich (1970). Bucher: My Story. Doubleday & Company. ISBN 0385072449. ^ "Crypto gear, John Walker and the History Channel". USS Pueblo Veteran's Association. ^ Heath, Laura J. Analysis of the Systemic Security Weaknesses of the U.S. Navy Fleet Broadcasting System, 1967–1974, as Exploited by CWO John Walker (PDF) U.S. Army Command and General Staff College Master's Thesis. 2005. ^ Prados, John. The Navy's Biggest Betrayal. Naval History 24, no. 3 (June 2010): 36. ^ Freeman, C. (30 June 2015). "China and North Korea: Strategic and Policy Perspectives from a Changing China". Springer – via Google Books. ^ a b Radchenko, Sergey S. "The Soviet Union and the North Korean Seizure of the USS Pueblo: Evidence from Russian Archives" (PDF). Cold War International History Project. Washington, D.C.: Woodrow Wilson International Center for Scholars. ^ Armbrister, Trevor (1971). Matter of Accountability. Barrie & Jenkins. ISBN 978-0214652141. ^ Gluck, Caroline. "North Korea drags its feet". BBC News. Retrieved 23 January 2007. 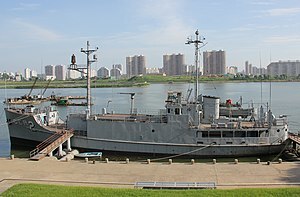 ^ "North Korean DPRK Liberation War Museum Video: Pueblo, U.S. Armed Spy Ship". Ryugyong Programming Center, the Democratic People's Republic of Korea's media website. Archived from the original on 17 March 2017. ^ "North Korea to put US spy ship captured in 1968 on display". The Guardian. 25 July 2013. Retrieved 25 July 2013. ^ Donenfeld, Jeffrey. "Full report: Visit to North Korea and the Pyongyang marathon". Jeffreydonenfeld.com. Retrieved 19 August 2015. ^ "Saturday feature: Old flag for an old spy ship". Shipping Times. Archived from the original on 1 February 2009. Retrieved 11 June 2009. ^ Washington Post, "Damages Awarded in USS Pueblo Case", 31 December 2008, p. 5. ^ Wilber, Del Quentin (8 October 2009). 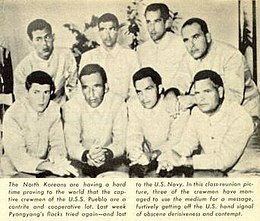 "Hell Hath a Jury: North Korea Tortured the Crew of USS Pueblo in 1968. 4 Victims Fought for Solace in the Courts". Washington Post. p. C1. ^ "Pueblo". IMDb. 29 March 1973. ^ "Pueblo – Trailer – Cast – Showtimes". The New York Times. ^ "The Pueblo Affair". IMDb. 19 January 1970. Spiva, Dave (December 2018). "11 Months of Hell". VFW Magazine. Vol. 106 no. 3. Kansas City, Mo. : Veterans of Foreign Wars of the United States. p. 40. ISSN 0161-8598. Dec. 23 marks 50 years since the release of USS Pueblo crew members from North Korea's custody. One died heroically and the rest were tortured daily for nearly a year. The ship, to this day, remains in North Korean custody.